Iliotibial band syndrome is an overuse injury resulting from inflammation of the iliotibial band. The Iliotibial band is a tough group of fibers that begins at the iliac crest of the hip and runs along the outside of the thigh, to attach to the outer side of the shin bone just below the knee joint. Its function is to coordinate with the thigh muscles and provide stability to the knee joint. 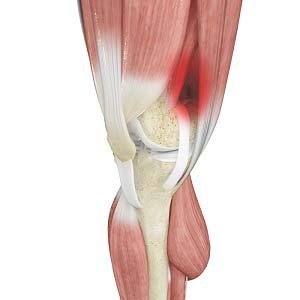 Iliotibial band syndrome occurs when the iliotibial band and the lower outside portion of the thigh bone at the knee joint rub against each other. It commonly occurs in athletes, cyclists, and runners. Children with iliotibial band syndrome may have pain on the outer side of the knee, swelling at the site of injury, and a popping sensation may be felt when the knee is bent and then straightened. Pain may worsen after running, climbing stairs, and walking and reduced when your child is at rest. Ice application: Ice packs should be applied to the injury which will help to diminish swelling and pain. Ice should be applied over a towel to the affected area for 15-20 minutes four times a day for several days. Never place ice directly over the skin. Medications: Your doctor may prescribe non-steroidal anti- inflammatory drugs to reduce the pain and swelling. Physical therapy: Physical therapists will teach your child stretching exercises and techniques to loosen the tight structures. This exercise is done by holding the affected knee close to the opposite armpit while keeping the other leg straight on the floor. These exercises help to strengthen the iliotibial band and the surrounding muscles. Ensure that your child wears appropriate shoes while running to prevent further damage to iliotibial band.